The 88th Lisbon Book Fair opened last Friday presenting more stands and more activities. 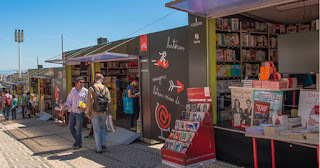 Until June 13th, Parque Eduardo VII hosts once more the Lisbon Book Fair. Every day until 10 pm almost 300 stands will present new releases, special offers, and book signing events. The fair grew about 3000 square meters, allowing more stands but, especially, new events such as the exhibition “88 years images with history”, a visit to the history of the event that started on the thirties. The show cooking area is bigger and following new trends a “selfie spot” was created, so you can take your picture with the panoramic view of the city as background and share it on social media. Discover here the daily program. With a prime location in the very centre of Lisbon, the Hotel Avenida Palace, with more than a century of history and fully renovated, is a symbol of the city.